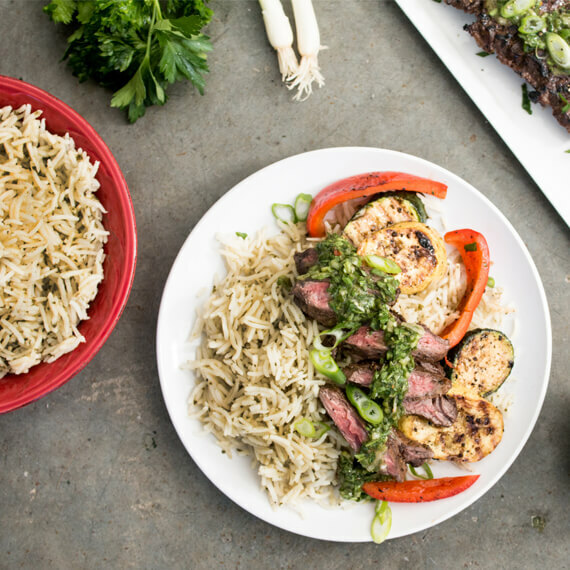 A delicious dinner with South American flair is ready in no-time with a marinated skirt steak on a bed of Royal Authentic Adventures Argentinian Basmati Rice! In a food processor combine garlic, lime juice, lemon juice, orange juice, onion, oregano, salt, and pepper. Pulse until the onion and garlic are finely ground. Transfer marinade to a plastic zip-top bag and add the steak. Seal the bag and allow to marinate, refrigerated, up to 2 hours. For the chimichurri, in a medium bowl stir together parsley, vinegar, oil, green onion, garlic, salt, and pepper flakes. Set aside. Remove steak from marinade, allowing excess to drip off, and discard marinade. Toss zucchini, squash, and bell pepper with the oil, salt, and pepper and thread onto skewers or place in a grill basket. Prepare a hot grill fire and grill steak and vegetables until cooked to desired degree of doneness, about 3-4 minutes per side. Transfer steak to a cutting board and let rest for 5 minutes. To serve, thinly slice the steak on the bias and serve over the rice with the vegetables. Serve chimichurri on the side.